Since 1983, someone has constantly been in prayer with Jesus in the Eucharist in our 24-Hour Adoration Chapel. Our peaceful, prayerful chapel is Tacoma's "Best Kept Secret"! The Eucharist is Jesus - Body, Blood, Soul and Divinity - under the appearances of bread and wine. 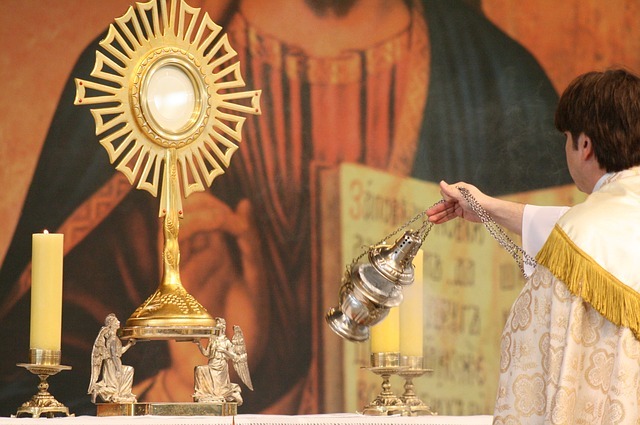 Jesus makes himself physically and spiritually present to us in the Eucharist. Eucharistic Adoration is essentially spending time with Jesus, praying before him in the consecrated host. Just as we spend time with our loved ones, we express our love for Jesus by spending time with him. Spend time with Jesus any way that you want to: read the Bible, pray the Rosary, meditate on spiritual reading, or speak to Jesus heart to heart, as you do with a friend. You may feel so worn out that you just want to sit, relax, and enjoy the sweet peace that comes from being with the one who loves you the most: Jesus. Consider spending a few minutes or an hour with our Lord in prayer. It will change your life!